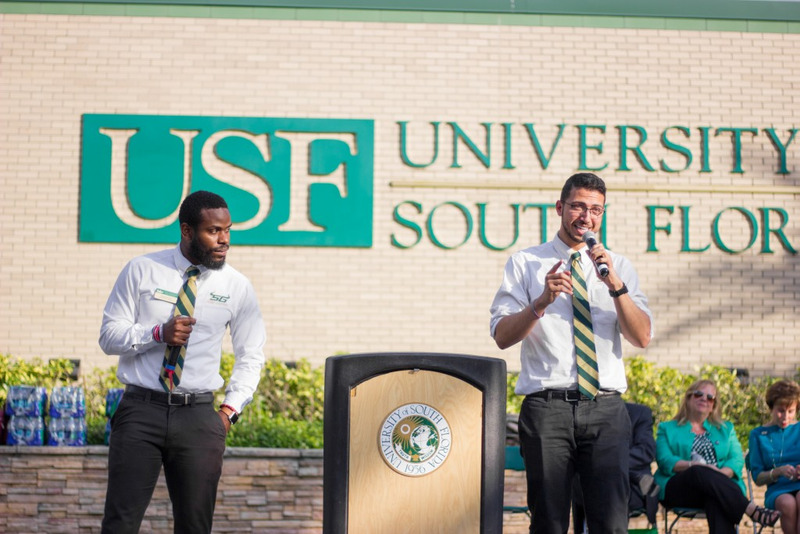 A moment many USF staff, faculty and students anticipated finally happened, completing one of the first crucial steps toward consolidation. 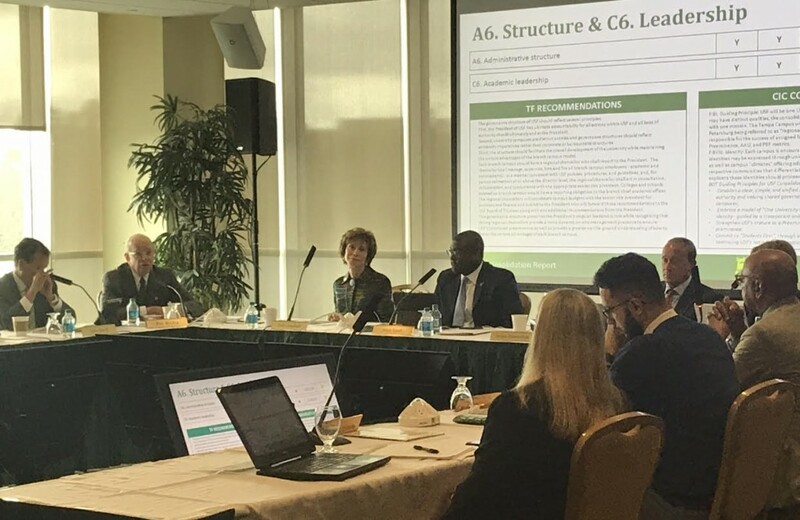 Mike Griffin, chair of the Consolidation Task Force, gave his final update bright and early on Tuesday morning to the Board of Trustees (BOT), outlining key recommendations that he said will drive USF toward consolidation of its three campuses — Tampa, St. Pete and Sarasota-Manatee — to operate under a single accreditation. But these recommendations are not the final input in the process. The BOT has a deadline of March 15 to adopt a plan and submit it to the Board of Governors. After that, it will be up to the Florida Legislature. The 137-page report included many changes, but emphasized one thing above others: The St. Pete and Sarasota-Manatee campuses will be “branch campuses” with high amounts of autonomy, including their own budgetary and hiring authority. However, “all roads lead to the president,” according to Griffin. This may quell some fears that these campuses had regarding being delegated as “instructional sites” without any authority. Not unlike how they operate currently, each campus will have a regional chancellor. Similarly, maintaining campus identity proved to be an important point, particularly when it came to degree offerings. Beginning in the 2019-20 academic year, the task force’s report proposes expanding degree offerings on all three campuses as well as hiring more faculty. These offerings include bachelor’s degrees in hospitality management and graphic design, among multiple new master’s degrees and doctoral programs on the Tampa campus. Though, it’s clear from the report that the branch campuses would receive well-rounded expansions as well. St. Pete could add bachelor’s in biomedical sciences, social work, nursing, elementary education and teaching, engineering and computer and information studies. While Tampa would receive no new hires during the 2020-21 academic year, St. Pete and Sarasota-Manatee could make a total of 64 new hires, according to the report. This would require about $28.91 million of spending. Even considering the importance of campus identity, one thing must be changed to be uniform: general education requirements. The report suggests that “faculty leadership” is appointed to “oversee the transition to a consolidated gen ed curriculum.” Though no clues were given as to how these requirements will change from their current state on each campus. Another change proposed sets its sight on Student Government (SG). The task force recommended a “system-level SGA” with “alternating campus officer representation.” This may play out with a single student body president on a particular campus, with the position shifting campuses ever year. The report does propose developing a process in which “student leaders” can assess and change the structure after two years. Toward the end of the meeting, there was a brief protest by three members of Students for a Democratic Society, unrelated to consolidation itself. Instead, the protesters were holding up signs imploring USF administration to “stop taking Trump’s side” and protect undocumented students. After a loud outburst by the group, they were forcefully removed from the room by University Police and the meeting continued. Although the drama interrupted the meeting’s progress momentarily, it’s now the BOT’s turn to take the reins and help USF progress toward the goal. It must now adopt what it views as the best plan that will ultimately be submitted to the BOG. During the meeting, trustee Jordan Zimmerman bluntly asked if the task force’s recommendation would be approved by the Legislature. “Make no mistake, we’re going to have to mobilize like that’s never been done in the past,” Griffin said.